As is generally the case, May came and went as our last month of spring. Once the temperatures start into the 90’s and things start to dry out, it’s very apparent that summer is in the air. I’ve learned over the years however, not to complain about it until the third month of 100 degree temperatures. Complaining too soon leads to insanity. Nobody likes a grouch, especially a hot, sweaty, insane one. 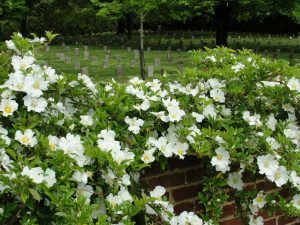 The month began with what has become my only major trip of each year, the annual Southern Garden History Society meeting. This year’s meeting was in Lynchburg, Virginia and was fantastic as always. Along with friend Bill Welch, Texas had the second most in attendance behind Virginia I believe. We can thank Becky Smith, Faith Bickley, and the Texas Rose Rustler folks from the Fort Bend area for that. They are a hoot. The talks are always good but the garden tours are even better. Lynchburg is a beautiful old city on the James River, about the size of Longview or Tyler. As the city slopes from the hills down to the river, it’s built on terraces. The steps up Monument Terrace are quite striking. The peonies and irises were in full bloom everywhere both in town and out. 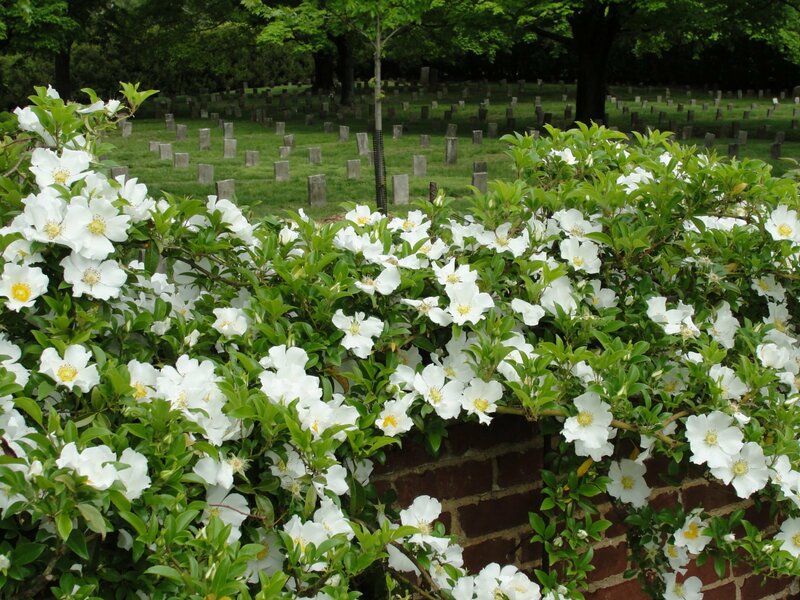 Several of my favorite spots where poet Anne Spencer’s home and garden, Thomas Jefferson’s Poplar Forest, the Old City Cemetery, and Pharsalia. Pharsalia is an old plantation home surrounded by beautiful gardens and apple orchards nestled at the base of the Blue Ridge Mountains. Next year’s meeting will be in Savannah, Georgia. Make plants to join us! Go to southerngardenhistory.org for more information. I also attended a longleaf pine field day near Jasper last month. You know how much I love pines. East Texas (and the rest of the Southeast) used to be made up of three different pine species; longleaf, shortleaf, and loblolly. Unfortunately most of what you see today is fast growing loblolly pine for commercial timber and pulpwood. Out of the spectacular 90 million acres of majestic longleaf pine that used to exist from East Texas to the East Coast, only 3 million still remains; and only about three thousand virgin acres that weren’t originally harvested for lumber. I’m having 20 acres of longleaf planted in Arcadia, hopefully this winter. I’ll keep you posted on its progress. I’d like to plant even more in the future. At work, construction started on our Conservation Education Center at the Stephen F. Austin State University Pineywoods Native Plant Center. It will be two fairly small brick buildings, one of them a classroom to house the many young school children that come to visit for environmental education programming. At last count, around 15,000 kids come through our SFA Gardens environmental education programs each year. Unfortunately we haven’t had any place to put them when the weather was bad, but now we will. The buildings are paid for by private donations. If you have any rich relatives that don’t know what to do with their money we still need more to add a rain water collection system, landscaping, LED lighting, and other green touches to the buildings. As long as I’m begging, what we really need is for somebody to endow the Pineywoods Native Plant Center! We always end up the stepchild at the table with the already endowed arboretum and azaleas gardens. Unfortunately native plants and the environment are often underappreciated. If it weren’t for our two plant sales, donations, and grants, we wouldn’t exist. Our Theresa and Les Reeves lecture series this month featured Todd Lasseigne, director of the new Tulsa Botanic Garden. He gave us the background and lined out the future of what is sure to be a wonderful garden. 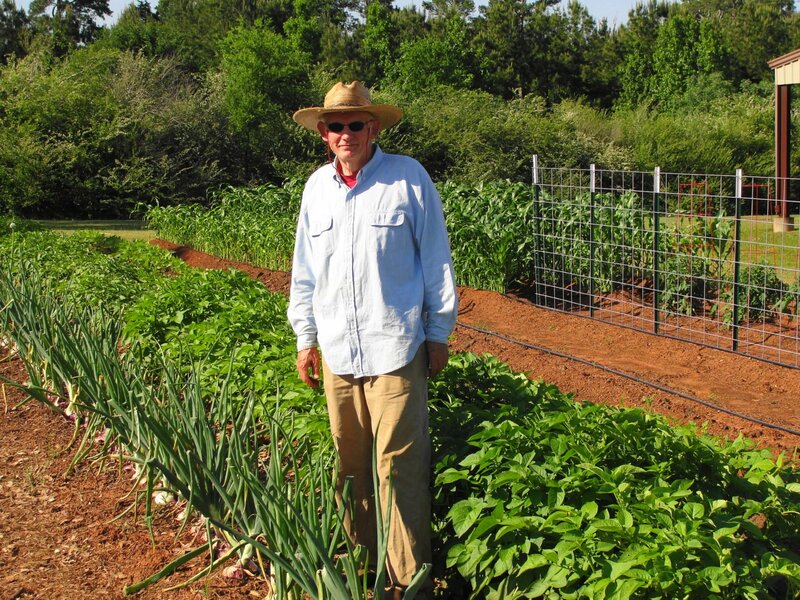 Next month we have Darrin Duling from the Mercer Arboretum in Humble. Things have been fairly active in Arcadia. We had our annual Powdrill Cemetery Homecoming on the picnic grounds next to my old house. As always, we collected donations to help keep provide maintenance for the local cemetery. Half of my relatives are buried in the Powdrill Cemetery while the other half are in the nearby Pleasant Grove Cemetery. We had dinner on the grounds and listened to stories of the old days in Arcadia. My momma provided chicken fried steak, sweet potato casserole, cream peas, and sour dough bread. My contribution is always mowing and maintaining the picnic grounds which I now own. There seems to be a plethora of eastern three toed box turtles in Arcadia lately. Maybe it just seems like more because Acer keeps bringing them to the house. Heck, for all I know it may be the same one I keep setting free every time. One day I stopped to get one out of the road before he got run over and it reminded me how I used to make my grandmother Emanis stop and let me rescue every one we came across. I can just imagine the horns blowing today if folks saw some lady and kid rescuing a turtle in the middle of the highway. In addition to my usual bluebirds, Carolina chickadees, and tufted titmice, I had a first this year in one of my “bluebird” nest boxes. My beloved little brown headed nuthatches hatched five eggs in the front yard. They are busy trying to feed the little guys now. The dogs and I will try to make sure a critter doesn’t get to them. Although my front perennial border hasn’t started to bloom yet, my row of flowering tobacco and sweet peas across the front fence have caused white a visual and scented display. 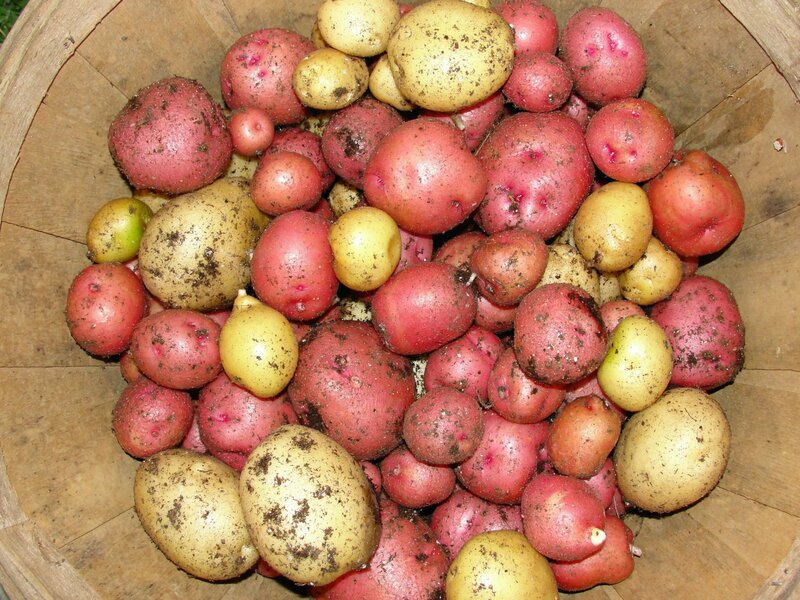 As soon as their seed ripens I’ll collect it and remove the plants. I even grew some true tobacco transplants for my cousin Jerry Pate who wants to make his own chewing tobacco. He’s married to my triple cousin Debbie. I guess that makes her a triple-and-a-half cousin now! Only in Arcadia. 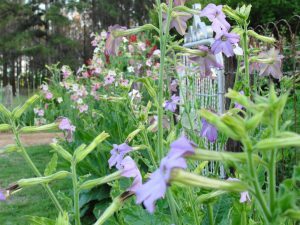 The John Fanick phlox and such behind my flowering tobacco and sweet peas should be in full bloom by the time they go to seed. 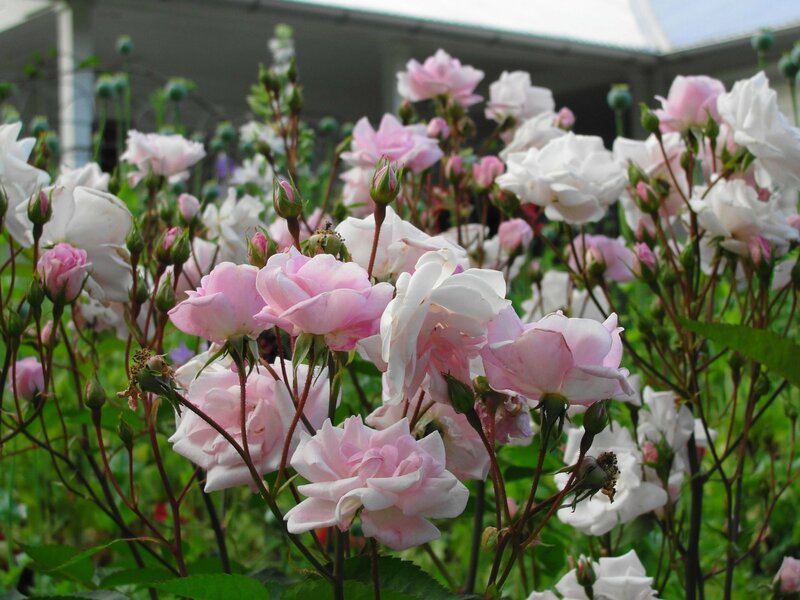 My roses finally came into bloom and have me thinking about rearranging things a bit in my small chicken yard/orchard/rose garden. The late freezes froze the blooms on two of my peach trees (along with my blueberries) so Belle of Georgia is the only one I’ll hope to harvest this year. My small backyard crown tire parterre kitchen garden provided me new potatoes and my first purple podded pole beans in May. I also picked my first yellow squash, cucumbers, and a few early tomatoes. The bulk of the tomatoes are generally harvested in June. I’m a bit embarrassed by my vegetable garden this year as I haven’t been able to keep up with it. 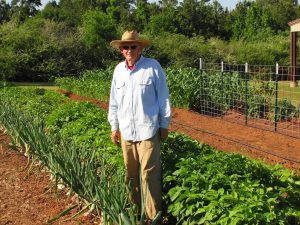 I’m especially embarrassed that my Nacogdoches pharmacist friend Bill Jobe, just started growing vegetables, and has the prettiest garden in Texas! I’d like to think it’s because he had a good teacher but when I look at my own messy garden I realize that’s not the case. Are you the long lost Shelby County Rhonda Golden???!!! Brother of famed squirrel hunter Rodney Golden? Great write up and the definitely a snapshot into the life of what every Texan used to (or should) experience in a typical May! I wish every little community till took care of their cemeteries. Nothing beats the fragrance of the flowering tobacco in the late summer evenings.